From Berlin's East Side Gallery -- the former wall. "Politics is the continuation of war by other meeans." 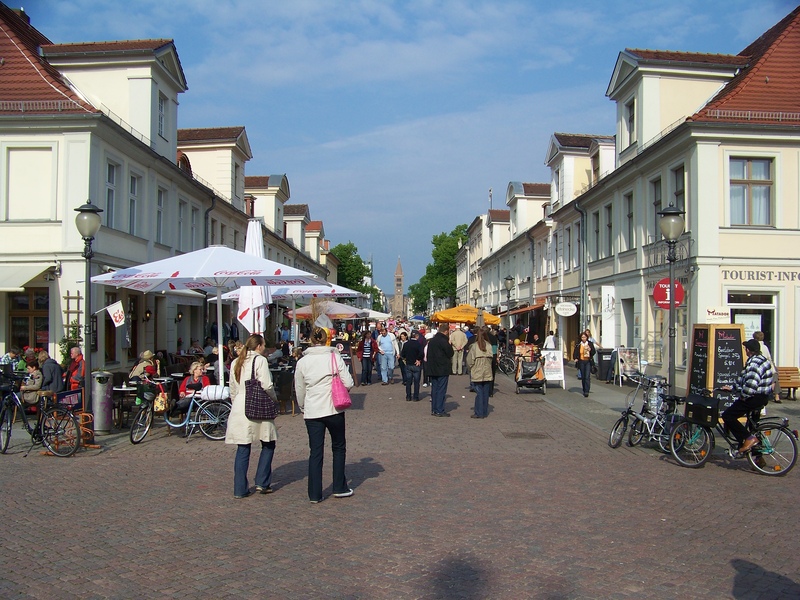 In 1991 I was interviewing a political activist in Schwerin, a city from former East Germany. 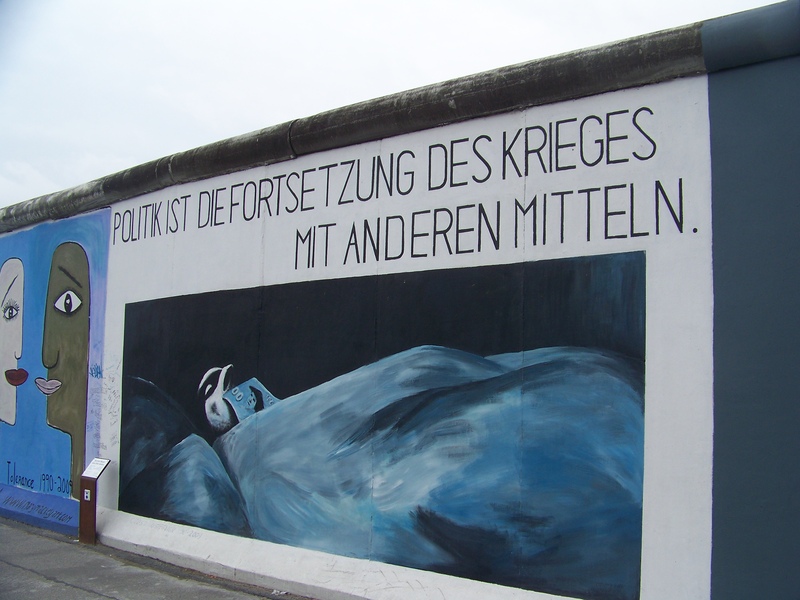 People were starting to notice the unexpected difficulties in bringing two cultures together, as “die Mauer in Kopf” (the wall in the head) continued despite the falling of the material Berlin wall. Germany had unified in 1990, but the people were being divided into Ossi vs. Wessi, East vs. West. The easterners resented the “better than thou” attitude of the westerners, who they considered arrogant. The westerners resented the over $1 trillion dollars spent to rebuild a country of 16 million people, especially as the “Ossis” seemed not to appreciate it. “Check back in 20 years, it will take a generation,” the activist told me. That was almost twenty years ago. 1) Hauptbahnhof. The main train station is a five level modern sleek station with shops, escalators, and an aesthetic that embodies the “new” in post-wall Berlin. Trains come and go on the diverse levels, a different feel that traditional stations. Yet when I first went to the “Lehrter Stadtbahnhof,” it was a sleepy S-Bahn station (public transportation), the last stop before heading across the wall to Friedrichstrasse. It was therefore quiet, small, and non-descript. That is gone completely. A Hauptbahnhof has risen up where the small S-Bahnhof once stood. 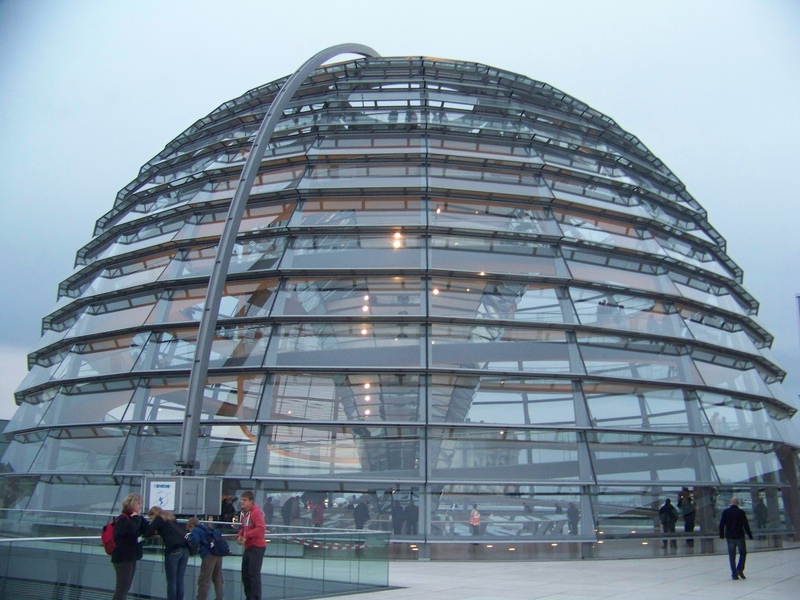 2) Reichstag area: In 1995 I had the luck to see the “wrapped Reichstag” from the artist Christo. It was an amazing exhibit. Then in 2003 I went to the top of the glass dome for the first time, it had been remodeled and put back into use for the parliament. Yet the big change is the maze of buildings that have arisen. Back in 1995 one had a clear view of the Reichstag from the S-Bahn, and you could easily see Christo’s work glistening in the sun. Now buildings hide the Reichstag, all of them new, modern and clean. The whole region that was once barren is now home to a vast governmental sector, crowned by an immense Chancellory building. Once it was a museum and a lot of empty space. 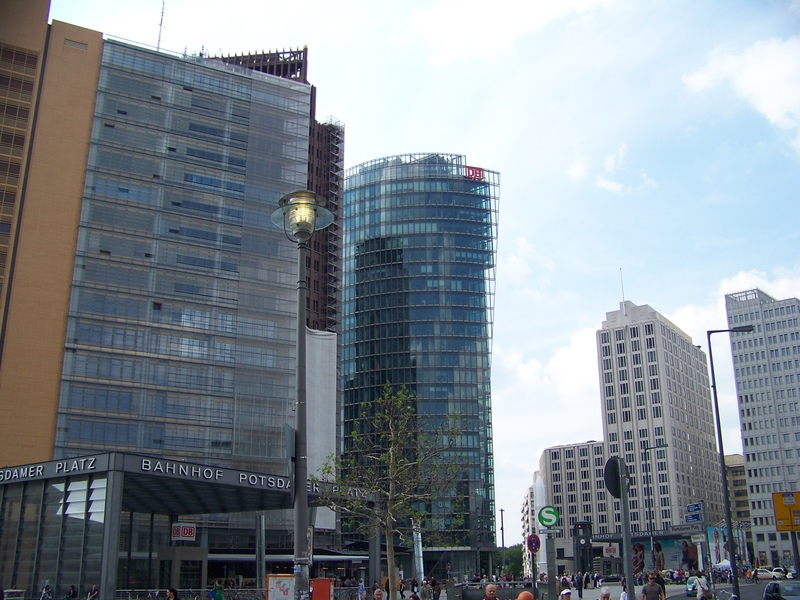 3) Potsdamer platz. While I was amazed as early as 1995 by the growth in this once empty area along the wall, the building done where “no man’s land” once dominated is unbelievable — and it keeps going. It isn’t the most beautiful urban landscape — very corporate, with sort of a Times Square feel — but it dominates the center of Berlin. It is immense, exudes wealth, and clearly brand new. 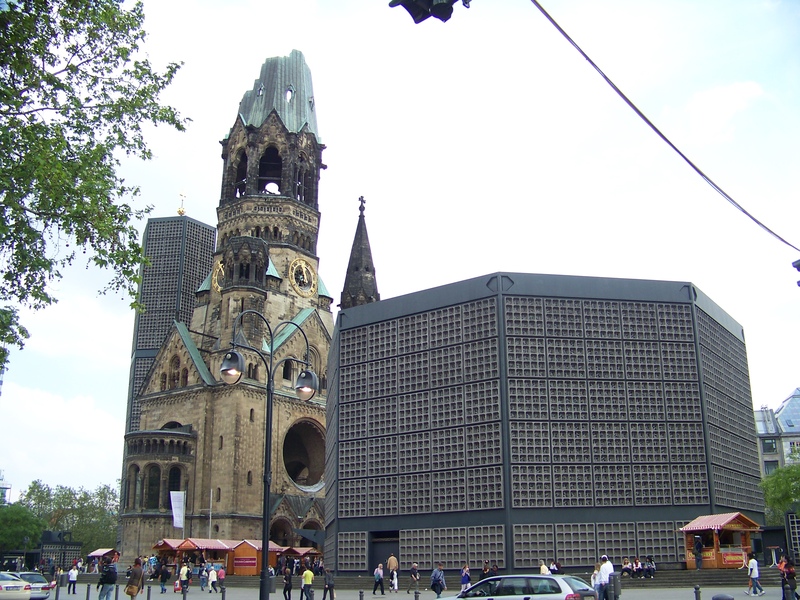 When I went to Potsdamer Platz in 1989 I had followed the wall from the Brandenburg gate, and it had a small snack cart and shop, with otherwise mostly empty space. It’s now a different world. 4) The Holocaust Memorial. From 1995 on, I saw signs of a future holocaust memorial, but even as late as 2003 nothing was there. Obviously, such memorials can be controversial. But now there is an abstract but powerful set of over 2700 concrete blocks, some taller than people, each a different shape, on land that is uneven. When you walk through it is physically uncomfortable and odd. Nothing stated on it says anything about why it is there — for that you have to find the entrance to the underground information center. Again, an entirely new Berlin. 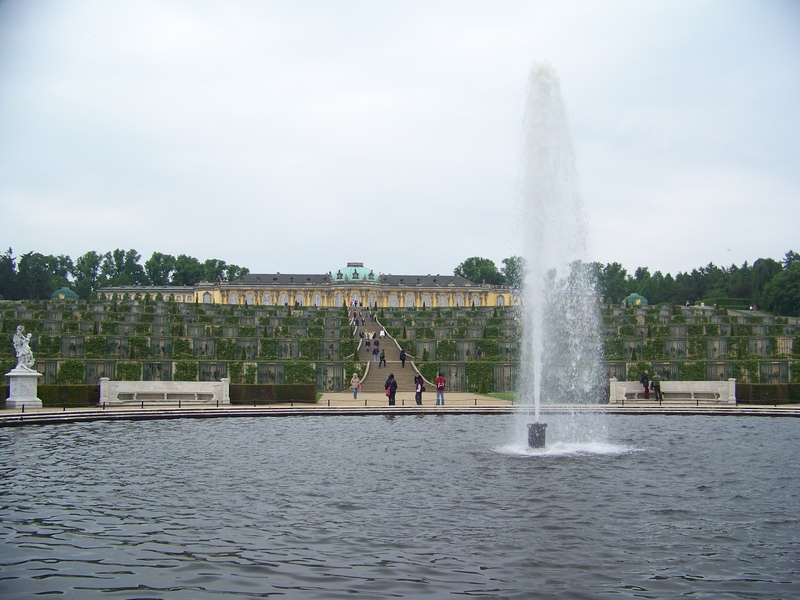 5) Potsdam. Outside of Berlin the city of Potsdam has been completely remade, starting with the main train station. Besides the loss of old Communist buildings, the station is modern and sleek, though it was odd to see Dunkin Donuts and Subway there (sorry, Subway, but you can’t compete with Doner Kebabs!) It was also odd to read in the city center that Hooters is coming to Potsdam. That’s globalization, I guess! I could go on; the world is much different than it was back in the eighties. This is true everywhere, but Berlin is just change on steriods, as cranes and construction sites still dot the city as the transformation continues. A subterranean parking center is being built on Alexanderplatz, where reconstruction has added buildings and made the place almost unrecognizable. From the early Doner Kebab mobil stands, to the shacks, and now to the permanent shops, the old East Berlin central square has taken on a new character. To be sure, there is poverty here as well. Go outside the central areas, and the old apartment buildings still have a socialist feel, despite paint jobs and renovations. The East is still obviously the East, even as the stark differences in appearance are fading. In 1991 it was easy to guess who was from the East and who from the West; that’s no longer the case. Nonetheless, I’ve witnessed and lived history in my relationship with Germany and Berlin. The world I knew is gone, Berlin is not the same city I experienced in 1989 (and 1991, 1992, 1995, 1996, 1997, 1998, 1999, 2001 and 2003). Seeing it change and then having a seven year gap between the last visits reinforce how drama of this transformation. When I was young, history was in the past, something I had not experienced. No more. I’ve lived history. I’ve been in divided Berlin, I’ve crossed over from West to East at Friedrichstrassse. I saw a post-Communist rally with Gregor Gysi speaking a year after unification, I’ve watched Potsdamer Platz get reborn, saw the old, wrapped and new Reichstags, and now experience 21st Century Berlin. At the Neue Nationalgalerie Thursday I saw an exhibit called “Modern Times,” or Moderne Zeiten, covering the years from 1900 to 1945. It ended with paintings depicting the rise of national socialism and the horror of the war, with a destroyed Germany at the end. Powerful and moving, it placed my experience of Berlin and German history in context. This is an on-going story with tragedy alongside glory. What I enjoyed most at the museum was a 65 minute film Sinfonie einer Grossstadt (Symphony of a City), which showed events from an average day in Berlin, filmed in June 1927. I intended to watch just a few minutes, but was mesmerized into viewing the entire show. That was during a period of relative optimism in post-WWI Berlin, before the great depression. People went through life in a very different Berlin — yet in many ways it is indeed the same city. Trains, trams and early cars coexisted with pedestrians, playing children, and life played out on the same streets we walk today. Yet that Berlin is long gone, even as remnants shape the present. So walking through Berlin in 2010 I realize this is also just a piece of history. Everything will change, there will be trauma, there will be joy. That’s the way history unfolds. 1933 exists in history, as does 1989. Appreciating the sites, sounds, and tastes of this moment is a unique glimpse into one episode of the long story of Berlin. One can visit cities and simply experience the present. It is a powerful and moving experience to travel through time as one embraces the present. A sense of the past, a glimpse of the future, and the immediacy of the now mingle together; that is Berlin. Dachau, Munich museums, the city on a sunny day, last week more Vienna, and no in the room internet, and I’ve not had the chance to live blog this travel course like I did last year in Italy. I’m taking notes, though, and will blog about it more when time comes, maybe “after the fact,” especially with a slow internet connection. Alas, my blogging is a bit curtailed this trip so far, as I don’t have in-room internet access. Also, with Vienna so full of activity, we’ve been on the move all day. Last night (Wednesday) we climbed St. Stephens, went to the Jewish Platz museum, spent time at Schloss Schoennbrunn, had some amazing cakes (Wiener Maedltorte is yummy! ), and went to a really interesting E-Guitar concert from Seth Josel at the Essl Museum just north of town. Dinner after that, and it was midnight before getting back to the hostel. The visit the Judenplatz Museum was interesting. 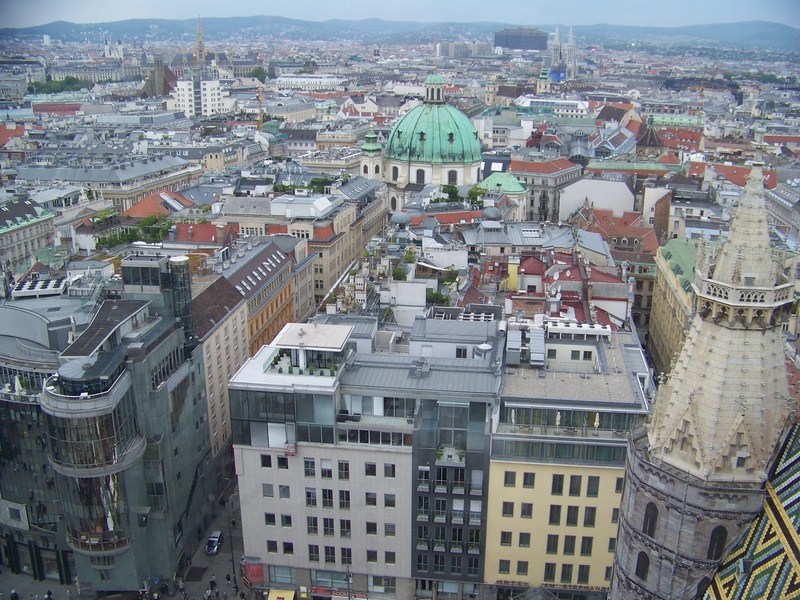 In 1421, as the Viennese were in the midst of building up St. Stephan’s, a holocaust took place. The entire Jewish community of the city was killed, the synagogue destroyed, and no trace of this event remained until recently. While “holocaust” may not be an apt term — the numbers were in the hundreds or perhaps a couple thousand, not millions — the event was as violent, destructive and evil as that perpetrated by the Austrian Adolf Hitler and his German supporters five hundred years later. Vienna is also the city where Hitler learned to hate Jews. As an aspiring artist, his work was mediocre, and he was constantly turned down in his quest to enter the art academy. Jewish artists were gaining fame with works he thought weird and out of step with tradition. As the empire was decaying, the anti-semetic and pan-German rhetoric appealed to him. Yet as the 1421 example shows, this was only a continuation, or at least a repeat of Austrian history. To be fair, in European history the Germans and the Austrians have a better record than other countries in their treatment of Jews. Prussia granted Jews full rights in the 18th century, including access to professions that had been limited. Joseph II liberalized Austrian laws at the end of the 18th Century. Jews were mistreated throughout Europe. Still, the symbolism of 1421 vs. 1942-45, and the fact a holocaust shrine is built on the site of the synagogue destroyed in 1421 speaks volumes of this shameful aspect of European history. Many in the West speak ill of Israel, or of Muslim states. The Israelis are oppressing the Palestinians, or the Muslims are dangerous, strange and all potential terrorists. Yet who are we in the West to cast stones? Sure, now Christianity does not support genocide or mass killing, and now our enlightenment values embrace human rights. But those are recent developments. We seem to pretend that past ills are irrelevant, or that it was natural for us to move from there to here. Muslims are violent, people say, whitewashing the intense and centuries long violence from the West. The bottom line seems to be fear of difference. That’s what caused such animosity to the Jews in the 15th century, and why Americans now see Muslims as dangerous and strange. Such fear can easily turn to aggression and a rationalization of violence and injustice. I’m sure the 15th century Viennese who supported the action against the Jews were not all blood thirsty immoral cretins. Nor were the Germans of the Third Reich, the conquistadors of Latin America, the US cavalry spreading West or the slave holders of the deep south. Throughout human history greed and/or fear of difference has lead to dehumanization of others and acts of evil. That’s true in all civilizations, East, West, Christian, Muslim, Jewish, Rwandan, etc. It can extend to ideology as well, as the acts of Stalin, Mao, Pol Pot and others demonstrate. Yet, Austria also represents an effort to embrace difference, at one point holding a multi-ethnic empire, and now being a strong supporter of the UN and international efforts to promote peace. I get the sense, reflecting on this history, that part of the human condition is somehow learning to accept that others can be different in custom, thought and history. It seems an easy lesson to learn, but reflects an effort to expand culture beyond the shared ideas that keep a small group united, and to embrace pluralism and diversity. That is a remarkably hard lesson to learn, though hopefully we’ve come a ways since 1421! First, sorry I have no pictures to post today. My camera’s batteries were out of juice — but tomorrow I’ll post some! Our first full day in Wien was great. 12 miles walking, four hours in the Art History Museum, delicious pastries, and the students were blown away by the grandeur and splendor of the central city. Vienna is one of my favorite cities, it has an amazing atmosphere, architecture, and vibrancy. Yet as I walked this city and as we talked to students about its history (mini-lectures in front of monuments and churches, as well as a full seminar about the piano and Mozart from Steve), I couldn’t help but think about how this city was capital of a 650 year empire which collapsed just under 100 years ago. Austria was a dying empire by the end of the 19th century. They knew it. Yet they also didn’t know how to stop it. One option was to liberalize, but the power structure, including Emperor Franz Josef, who came to power in 1848 and ruled until his death in 1916, worked against that. Franz-Josef was one of a long line of Hapsburg rulers, starting with Rudolf in the 13th century. Liberalizing — moving towards democracy, capitalism, and a focus on individual rights — went against the aristocratic traditions which defined the empire. Indeed, the Austro-Hungarian empire as it was then known (a sop to Hungarian nationalism) was structured on ideals and traditions that had persisted for centuries but which had become anachronistic. The Catholic Church was a powerful force, but throughout Europe it was on the defensive. Back before Napoleon the “Holy Roman Empire,” ruled by a Hapsburg emperor covered almost all of Europe between France and Russia. But it wasn’t an empire as we’d now define it (Voltaire famously quipped that ‘the Holy Roman Empire was neither holy nor Roman nor an empire’). The Hapsburgs held large swathes of territory, and nominally ruled many others. But in reality it was a decentralized even anarchic set of diverse principalities and communities with no core principles determining governance. In some places the church had control, there were other ‘free cities’ run by local councils, and there were numerous territories governed by a ‘prince,’ or an aristocratic landlord. The rules and procedures for how this operated were rarely written down, and perhaps couldn’t be. It was based on tradition, custom and local practice. The most powerful “princes” were “electors” who would meet to choose the Emperor. 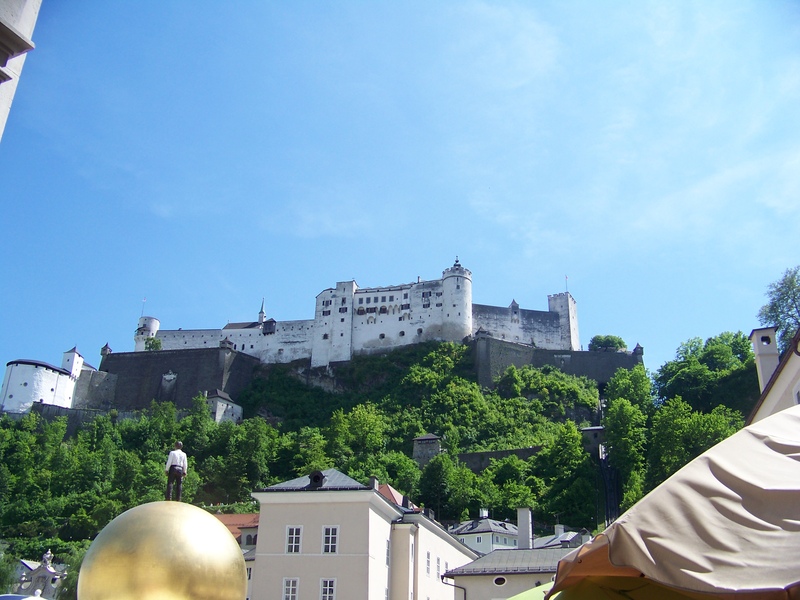 But even that choice was usually pre-determined — it would be the Hapsburg monarch. The benefit to the participants was that the Hapsburgs really didn’t rule most of the Empire. Cities, local aristocrats, the Church and others had their territories and things operated according to custom and tradition. Empress Maria Theresa started to change that in the 18th Century, consolidating Hapsburg power and creating a true central European empire. Napoleon’s wars destroyed what was left of the old Holy Roman Empire, and Austria survived as a large multi-ethnic empire based on anachronistic traditions in a modernizing world. Yet it begin the 19th century the dominant power, while Napoleon’s defeat seemed to be a defeat of liberalism and enlightenment values. The enlightenment proved resilient, however, and as Austria clung to tradition and looked skeptically at capitalism, industrialism and democracy, the rest of Europe moved forward. The Austrians, trapped by tradition, culture, and history — how could a 650 year old empire truly be endangered? — played for time and hoped for rejuvenation. On the fringes, populists thought they knew what was wrong. They were convinced the problem was a refusal to embrace pan-Germanism and the influence of Jews. While the populists were easily dismissed as right wing xenophobes, their growing influence in the 19th and early 20th centuries would shape a young would-be artist, a provincial Austrian who,after some time leading the Bohemian artistic lifestyle, turned to the far right: Adolf Hitler. These nationalist movements were diverse, and existed uncomfortably alongside liberalizing efforts from those wanting a modern,democratic Austria. The right wing movements were held together by anger at the status quo, a clear enemy image (usually the Jew, but also socialists, the monarchy, and ‘liberal internationalists‘), and a stark appeal to the fears and emotions of a people who realized their country was moving away from what it had been in the past, but were afraid of where it might go in the future. As I wander through modern Vienna, it‘s clear that while that old world did indeed crumble, Austria today is in many ways far better off than it was during its imperial heyday. The people are wealthy, the country stable, and as part of the European Union they have rejected the wars that had European peoples at each others’ throats for centuries. To get here from there they had to digest the end of an era, a fundamental change in their sense of what it meant to be Austrian, and the very nature of how their world was ordered. Fear of that kind of existential change meant it could only happen with systemic collapse, in their case through the trauma of joining the Third Reich, and suffering the physical and moral destruction of WWII and the Holocaust. Pondering that, my thoughts wander to the US. Are we also going through an existential shifting of values and conditions. Are the “old ways“ no longer functional? Are at least the fringes of the so-called ‘tea parties‘ a kind of gut fear reaction of the far right, just as anti-Semitism and pan-Germanism was in 19th Century Austria? Is the anger at “illegal immigration,” often anti-Mexican sentiment rationalized with claims its just about the illegality, similar to 19th Century Austrian anti-Semitism? No, I’m not saying this will lead to a Holocaust or American Nazis — I don’t think that will happen, our culture is too different. I’m thinking more generally if we’re not undergoing the kind of transformation, albeit from a very different to a very different system, that Austria undertook. And if so, will the transition be as difficult as it was for this once great Empire, now a shadow of what it once was. I also think about where we spent a day trying, ultimately successfully, to evade the volcanic ash cloud — London. The British Empire went through a similar transition, and despite pain and real hardship, came through successfully. 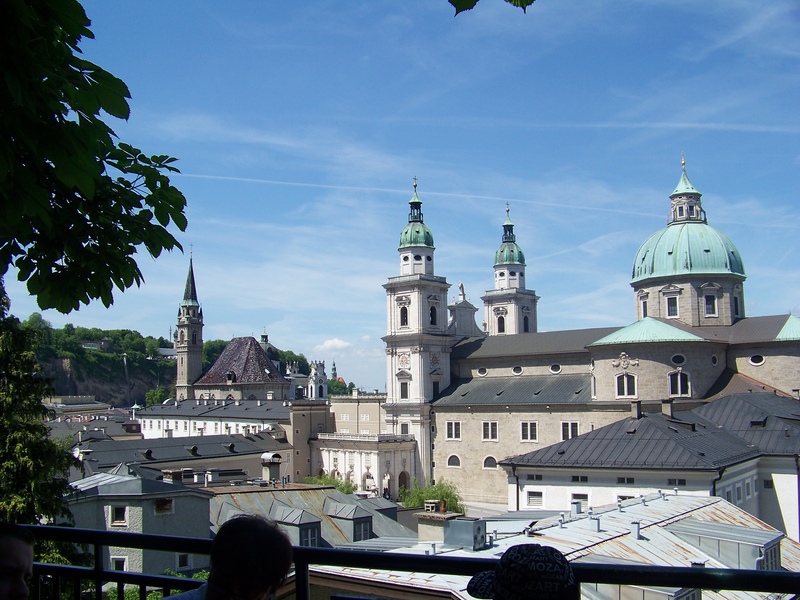 Their liberal pragmatic traditions allowed gradual transformation, while Austria’s did not. We’re much more like the British; does that mean we’ll muddle through change, with the extremists making noise, but never gaining the upper hand? Of course, these comparisons could be off base. Visiting former empires in a time when it looks like US power and prestige is under siege makes it perhaps too easy to draw uncomfortable comparisons. But when I hear people complaining that they want the “America that used to be” to come back, that reminds me of those Austrians who didn’t want things to change. Change is real. We’ll never be the America we used to be. History doesn’t work that way. That doesn’t have to be a bad thing though. Not much to post yet, but after waiting for hours of delays in both Boston and London, we dodged the ash cloud and made it to Vienna on the 17th — 10 hours late, but on the right day. British Airways came through, changing their afternoon Vienna flight to a larger plane to include our 24 person group (thanks to the ash cloud we missed our original connection). Last night the faculty went out and had a traditional Austrian meal — Steve and Sarah had Wienerschnitzel, and I had goulash. I also enjoyed a Hefe-Weizen (a yeasty wheat beer), and thanks to Steve we all had sauerkraut. If you’re used to American sauerkraut and hate it (like me), you need to try the real stuff over here, it is good! Why do we ruin sauerkraut in the US? 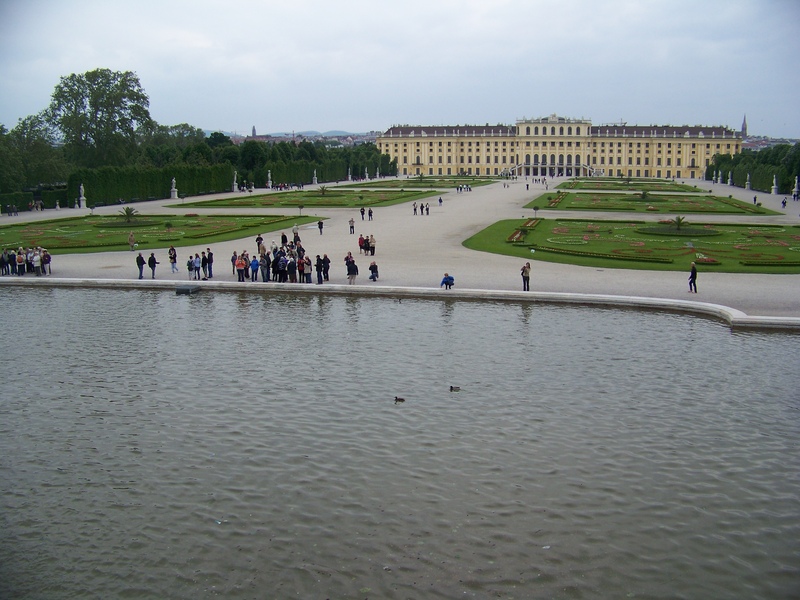 After today I’ll be blogging from Vienna, part of a two week travel course to Vienna, Munich and Berlin. In February 2009 I blogged from Italy, starting with the post “Vatican Voices.” This time my meals, souvenirs, and melange will be relatively inexpensive, thanks to the financial crisis hitting Europe. The Euro now costs $1.25, compared to the $1.60 it cost a couple years ago. To be sure, back when I first took students to Italy in January 2001 it was 88 cents to buy a Euro. In that trip students were buying leather jackets and feasting at fine restaurants. Still, it’s been awhile since the dollar was that strong. Update 3: We’re here, at Wombat’s in Wien. 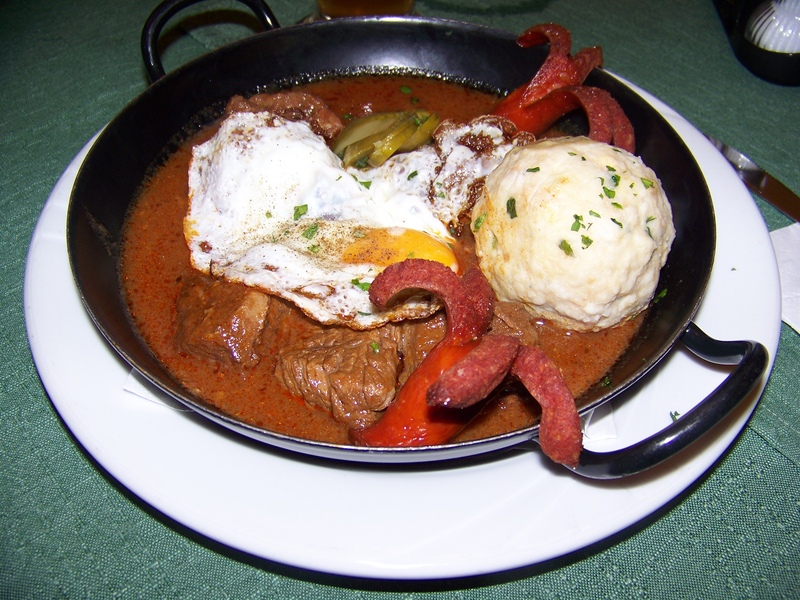 A long trip, but we made it, and I enjoyed a great goulash with bread dumpling and Weissbier for dinner. Now, a well earned night of sleep! Co-instructors of this course are Dr. Steve Pane (Music history) and Dr. Sarah Maline (Art History). Between us we plan to explore the art, music, and political history of these three cities, with consideration of the present crisis and what it means for the EU. One thing about a travel course is that it takes one out of the mindset of thinking about the subject matter as independent, as if outside space and time. 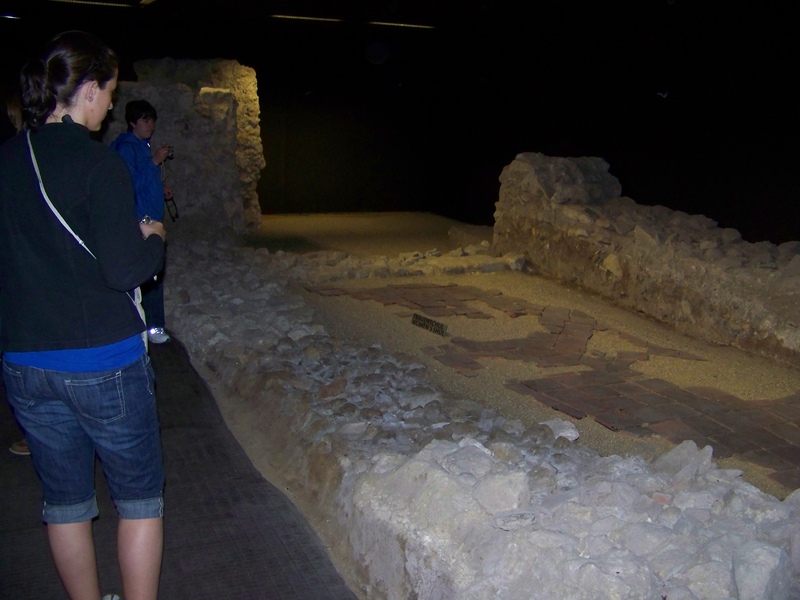 The history of the cities we visit is part of what they are today, and current events can only be understood by seeing the present as reflecting aspects of the past. Moreover, teaching about political science and political history becomes far more interesting when connections are made to the worlds of art and music. In academia we treat such things unidimensionally, you take an art course or a poli-sci course. In a course like this these blend together without disciplinary boundaries. That’s the way the real world is. The volcano is spewing more ash into British airspace, meaning we may have a “mini-crisis” of having our flight canceled or delayed. I’m not sure how we’ll deal with that — presumably we won’t know until we’re at the airport and then I guess we’ll have to ‘wait and see’. If that happens the key is to look for the silver lining of that experience, fate works in strange ways. Also, though not reaching my goal weight of 186, I have gotten very close (189.8), losing thirty pounds since February 12. The impetus for this disciplined and successful diet was illness. I was unable to keep anything down for a day, and felt horrible, one of the worst bouts of flu I’ve had for a long time. Yet that propelled me to a needed diet, and now my “in shape” clothes fit, and that feels good. Still, I’d like a nice normal on schedule flight. Last year we almost missed our connecting flight to Rome, and thanks to Delta airlines we barely made it. On the way back the snow storm that hit the northeast had us delayed, and we waited hours before we found out we would make it back — and then it was touch and go if the van could come to Portland and get us. On top of that, arriving home from Italy at midnight, our cars were buried under 30 inches of snow. Last month a flight that was supposed to be Chicago-Portland became Chicago-Boston with a car rental to Portland. And now volcanic ash? Well, if it happens, we’ll deal with it. Update: We are now at Boston Logan. We were about to board when the pilot and crew came out and said that due to the ash cloud, departure is delayed until at least 10:00 Boston time. So students are playing cards, listening to I-pods and waiting, I’m reading A Nervous Splendor about Vienna in 1888-89, by Frederic Morton, and we wait…obviously we’re missing our connecting flight to Vienna, but if Heathrow is closed that wouldn’t take off anyway. But I have a comfortable rocking chair here, and the airport is pleasant. Update 2: We took off shortly after 10:00 on the 16th, but missed our flight to Vienna. After a long wait in line to rebook, we had a very helpful British Airways Rep. He scolded the rebooking folk, “you had a group of 24 and you didn’t think to rebook them?” and after giving us vouchers for a free lunch, managed to get a larger plane for the afternoon Vienna flight. Last year Delta held a Rome flight and bused us across JFK to catch it, this year British Airways provides a larger plane so we can make it. UMF has clout! Anyway, the ash cloud could still hamper us, but it looks like we should start boarding for Wien in a half hour!